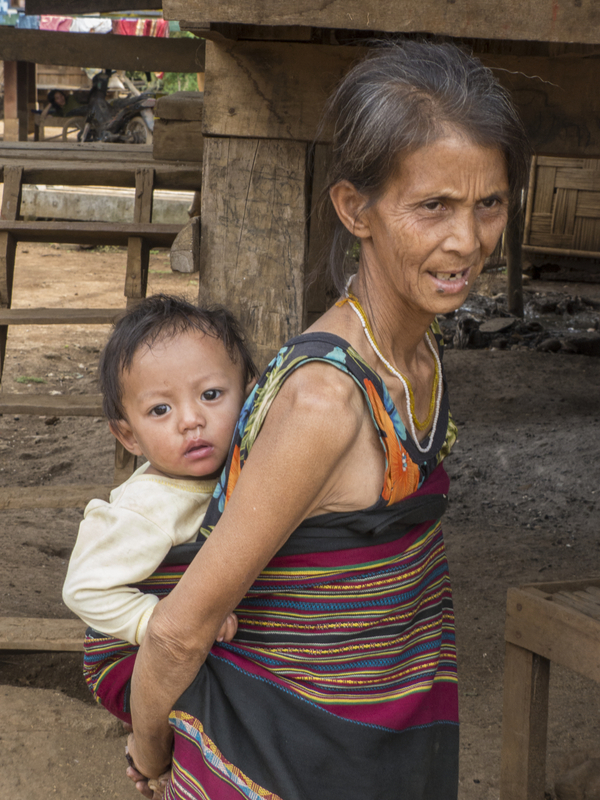 There were 68 ethic minorities or tribes in Laos and but they have now diminished to 49 as the ethnic minorities intermarry with the Laos people. 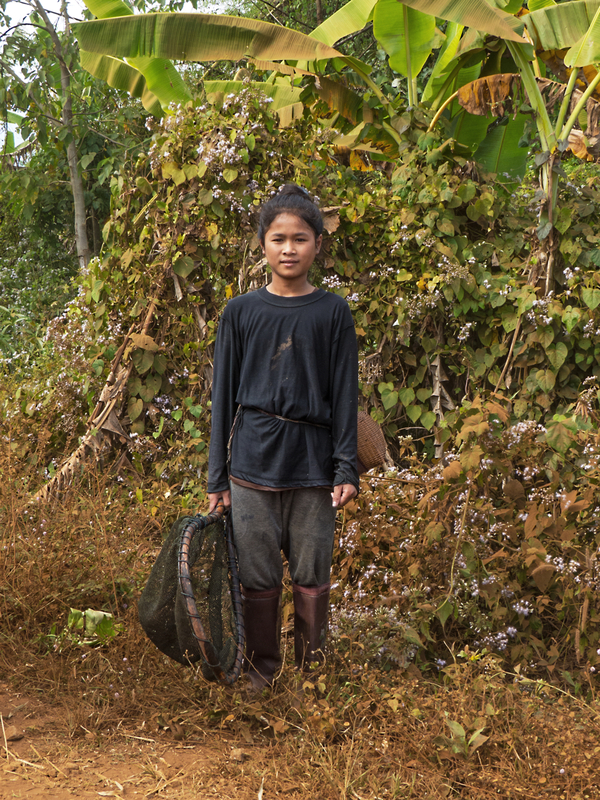 There is a swiftly disappearing opportunity to visit the remaining ethnic minorities in Laos. In particular Michel and I became interested in the Katu tribe. There was a documentary in Luang Prabang at the Ethnic Cultural Museum that caught our interest and Michel had an read an article in a magazine. 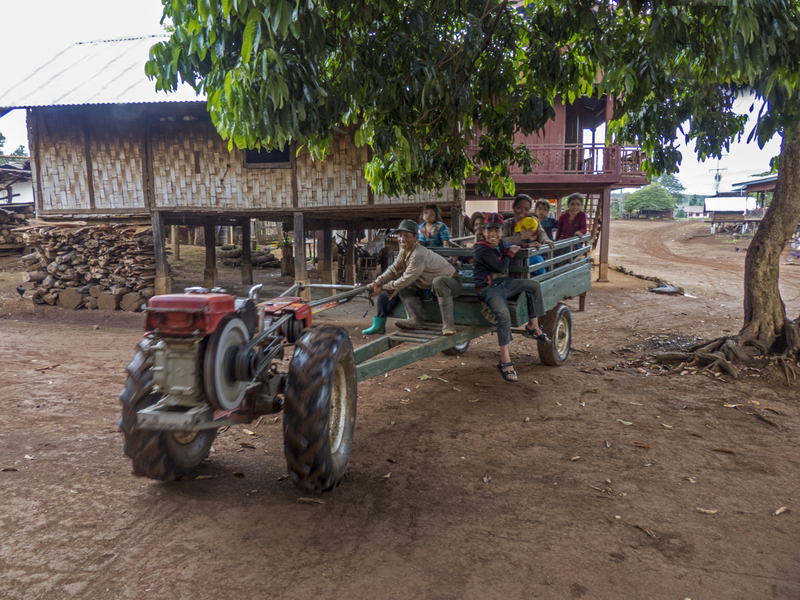 We have traveled on from Luang Prabang through Vientiane and Savannaket to a town in Southern Laos called Pakse. 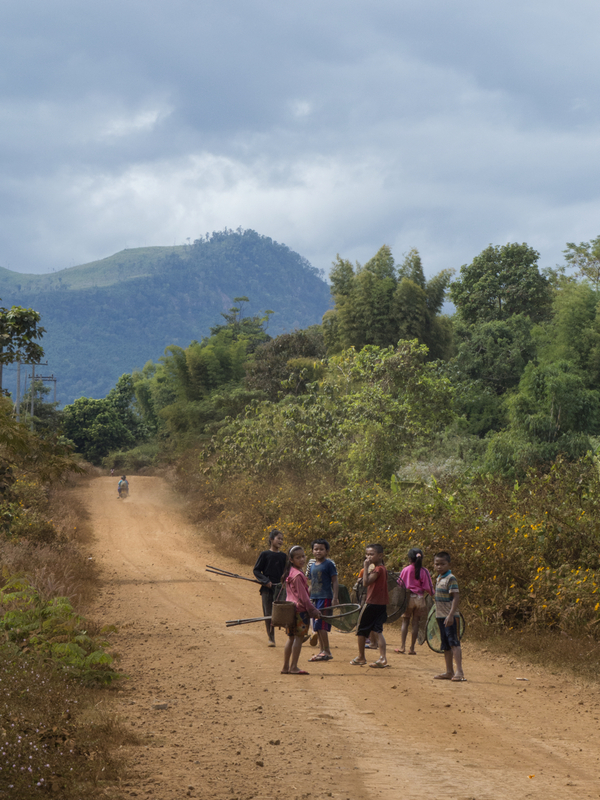 Pakse is a small city on a main road where tourists pass through and from there venture out onto the Boloven Plateau. There are waterfalls and coffee growing plantations where it is possible to chill out for a while on the Plateau. 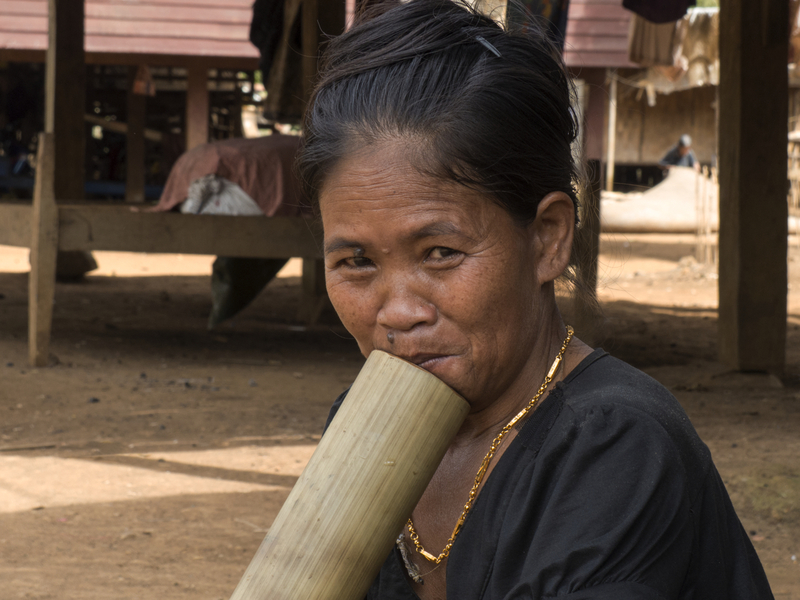 There are 14 different tribes, descended from Mon Khmer, spread out on the plateau including the Ta-oi, Katu, and the Alak. All of the tribes’ primary religions were animists and were based on a belief in spirits and the need to make sacrifices to those spirits. They speak different languages but their traditional clothing and weaving are very similar. We decided we needed an interpreter for this adventure and used Green Discovery Tours. From my research Green Discovery had a reputation for respecting and protecting ethnic cultures. We arranged a two day trip complete with van, driver, and our guide Aod for 330$ US. We would go far back on the Boloven Plateau almost to Vietnam and a town called Sekong. 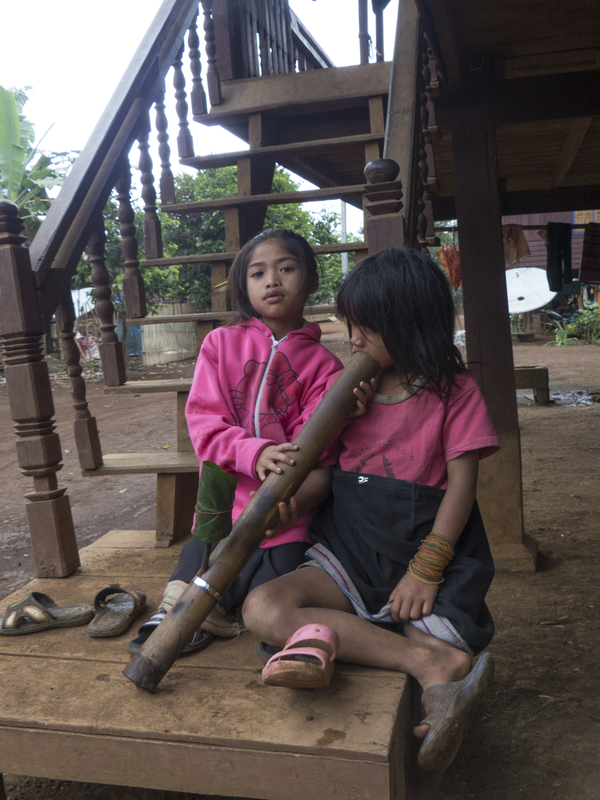 There is a Katu village called Ban Kandon outside of Sekong and we would spend a full day in that village. 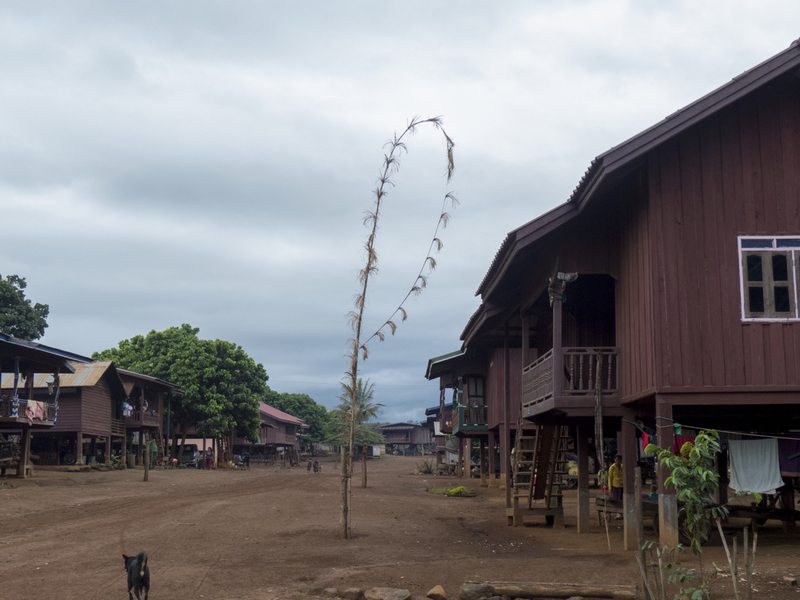 The second day we would visit another Katu village frequented by tourists near the Tat Lao waterfalls. In preparation for our visit to Ban Kandon we were instructed by our contact at Green Discovery to buy specific gifts for the Katu. 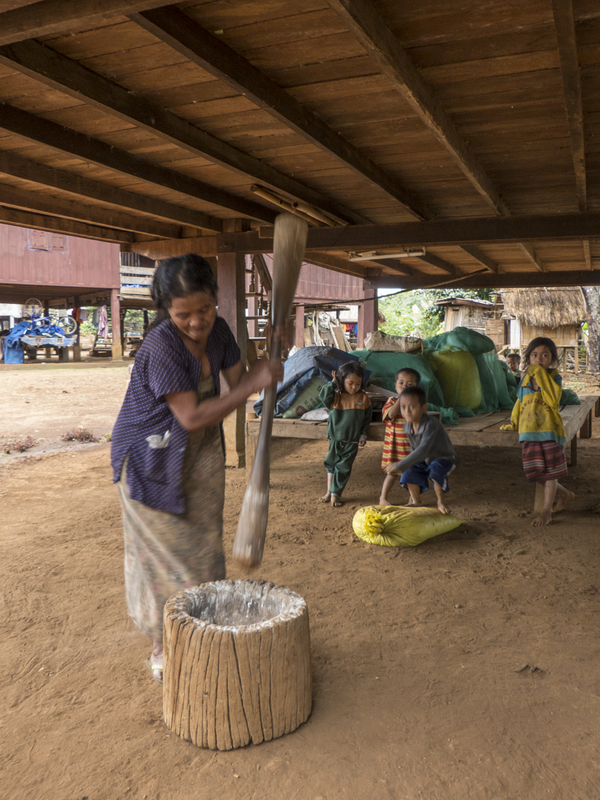 They were; a soccer (football), Laos study and history books, two rattan kickballs used locally for a favorite sport, and finally snacks and sweet crackers. In addition, we would stop at the local market the day of the trip to buy food for a lunch to be prepared for us by the Katu chief’s wives. We were lucky to have a new friend come along with us on this trip. Delphine is from France and a solo female traveler. There are more and more solo female travelers out there these days. All independent brave women.. The first day we all got up early and met Aod and the driver. We were all feeling good about a chance to meet these Katu. It was a cool sunny day and perfect for heading up on to the Plateau. Aod was extremely knowledgeable and provided information on Katu customs and beliefs. Aod has been a guide for 6 years. 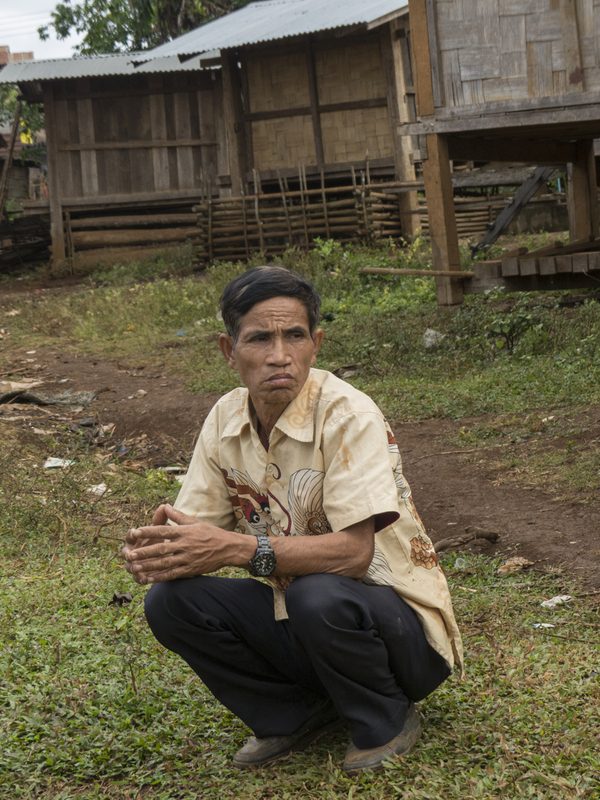 During that time he has been able to observe the decline of the ethnic minorities on the Boloven Plateau and is concerned about how quickly the change is coming. Most villages have electricity now and are connected by good roads, very different from 6 years ago. Televisions are watched daily in even some of the primitive huts. Gang signs and gang behavior are mimicked by young children and teenagers everywhere in Laos. Traditional music and instruments may be lost as they are replaced by Rapp, Pop music, and karaoke. So dear readers, please forgive me if I take a little extra time in this post to share everything I learned about the Katu. Even the tribe at Ban Kandon who have strong leadership and are working hard to keep their traditions has had many old customs slip away. This post may be a unique opportunity to document the beliefs and customs of the Katu as they are today. 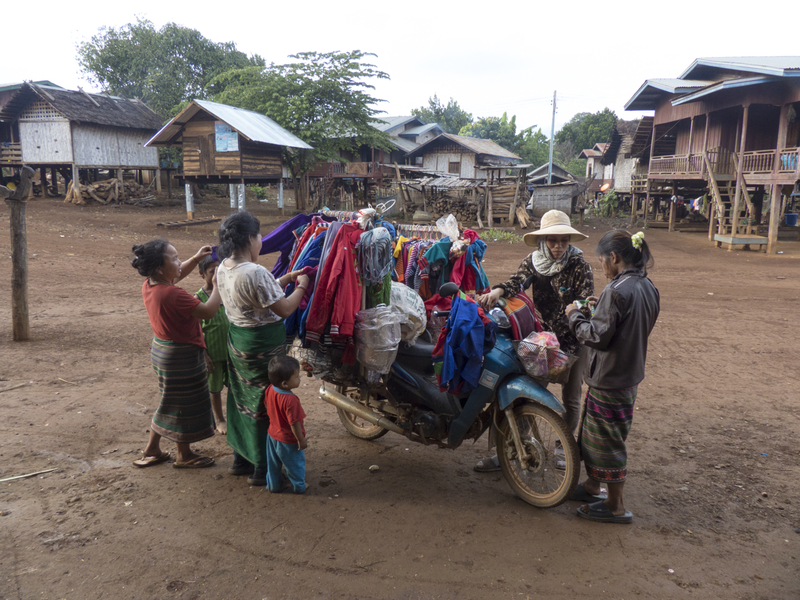 After a visit to the market and a few hours in the van we arrived at the Katu village of Ban Kandon. We were all invited to come in the chief’s home to sit for a while and talk. The chief’s name is Wipad (weepad) and he is 66 years old. He changed cloths putting on his best dragon shirt (for guests) when we arrived. He has a calm manner but also authoritative. He is proud of his tribe and his customs. He expects to be treated with respect and as a leader. He was courteous and patient during our entire visit. We were introduced to Wipad’s wives who went to work preparing the food we had brought for lunch. Most Katu are monogamous but Katu customs say the chief may have more then one wife. Wipad has 3 wives and a total of 9 children. 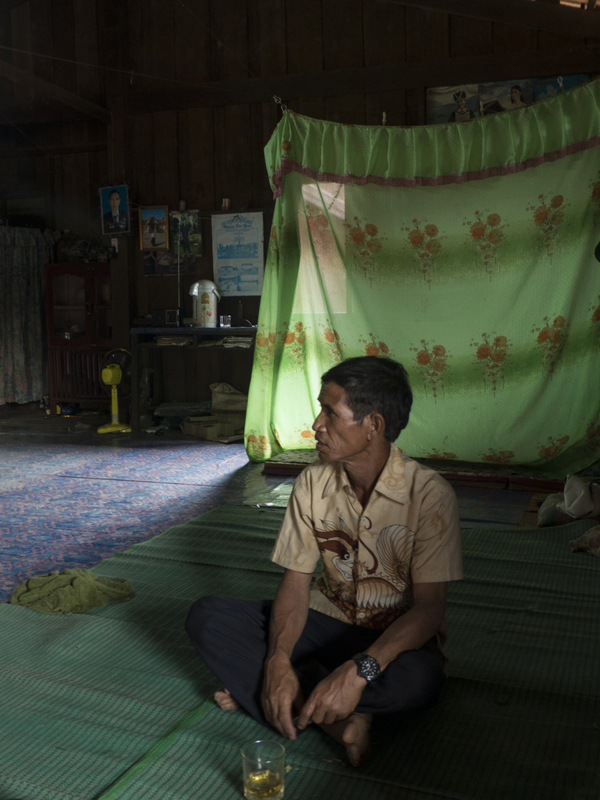 Most of his children have married and moved away but 3 still remain in his home. 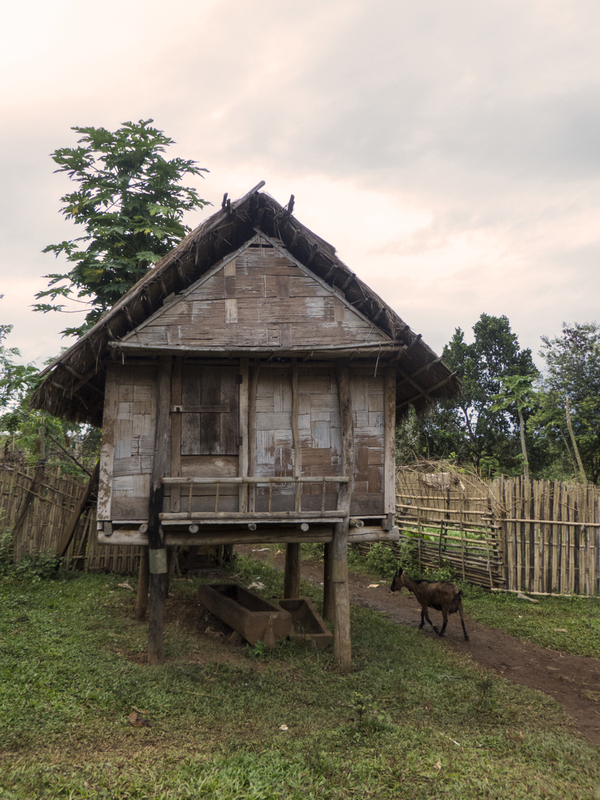 Wipad’s home is no longer a traditional Katu hut but is rather a normal Laos wooden house on stilts. The house is one room and we enjoyed the open windows that are positioned perfectly to catch the breeze. There were two areas sectioned off behind curtains for privacy. While visiting we sat cross legged in a circle on large mats in the middle of the room. We all introduced ourselves as Aod interpreted. 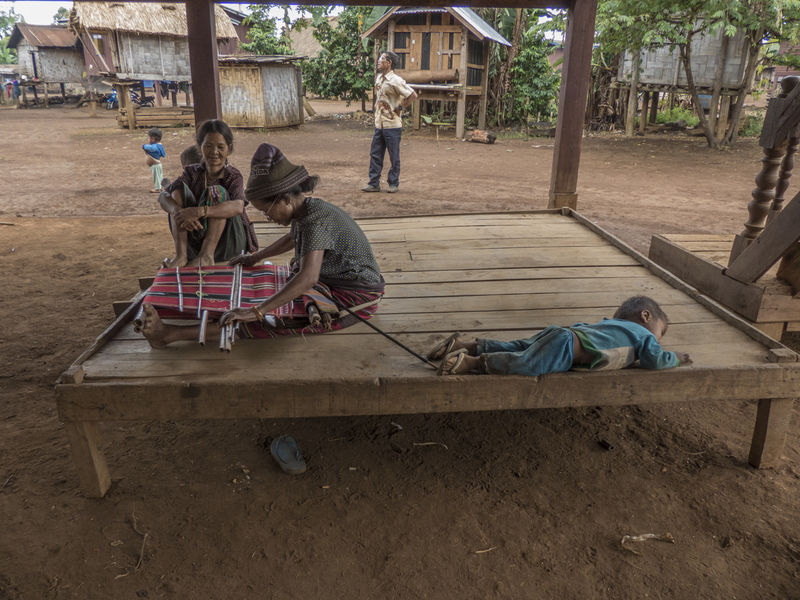 Wipad led his people from their original village in the forest near Attapeu in 1996 to the new village Ban Kandon. The Laos government initiated the idea of the move and Wipad met with them in Vientiane and Luang Prabang to protect the interests of his people. There are photographs of him dressed in his military uniform and with the leaders of Laos on the walls of his home. The government provided the land that his tribe currently lives on but first the land had to be selected, cleared, and prepared. A few members of the tribe began clearing the new land in 1993. 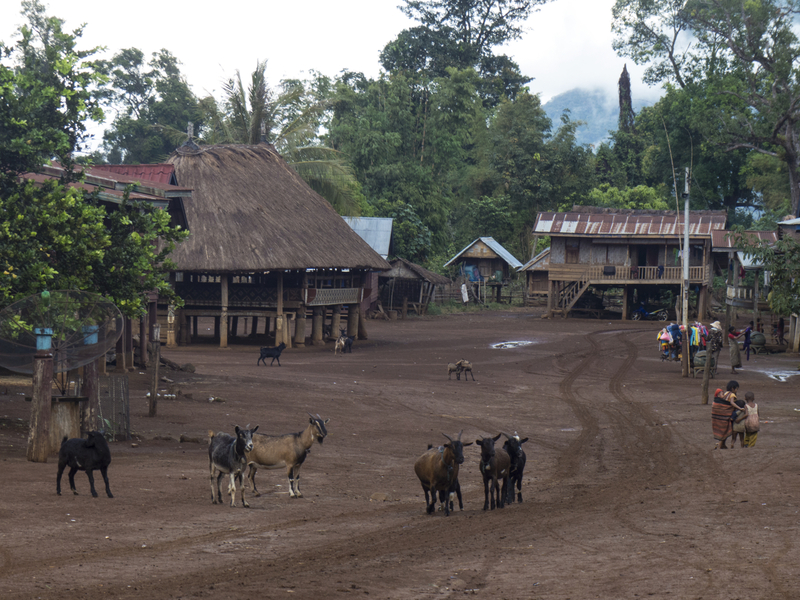 In 1996 Wipad brought 60 families and their livestock 94 kilometers to the new village. About 15 families refused to leave the old village and remain there to this day. 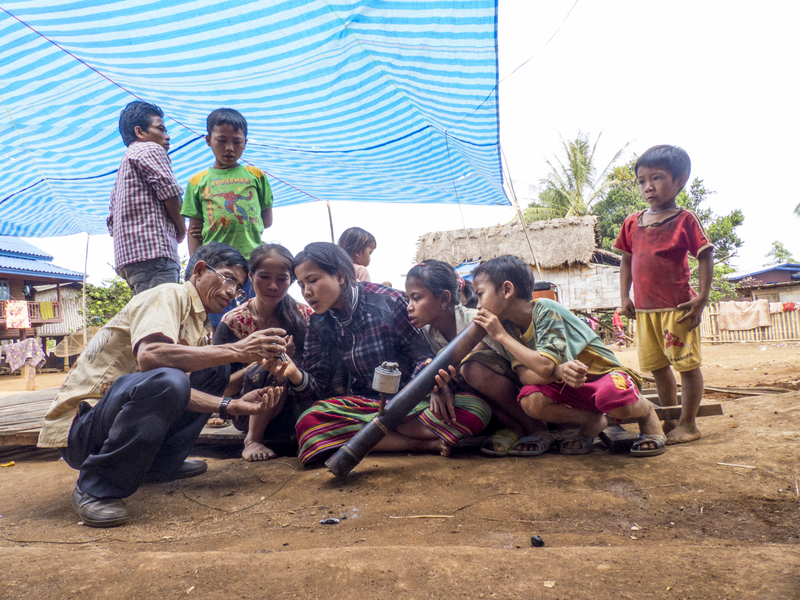 The reason for the relocation was to move the families away from UXO (unexploded ordinance from the Vietnam war). Wipad also believed there would be better opportunities for education in their new home. The Katu people are rice farmers. They used to live in the forest and clear land to plant the rice. 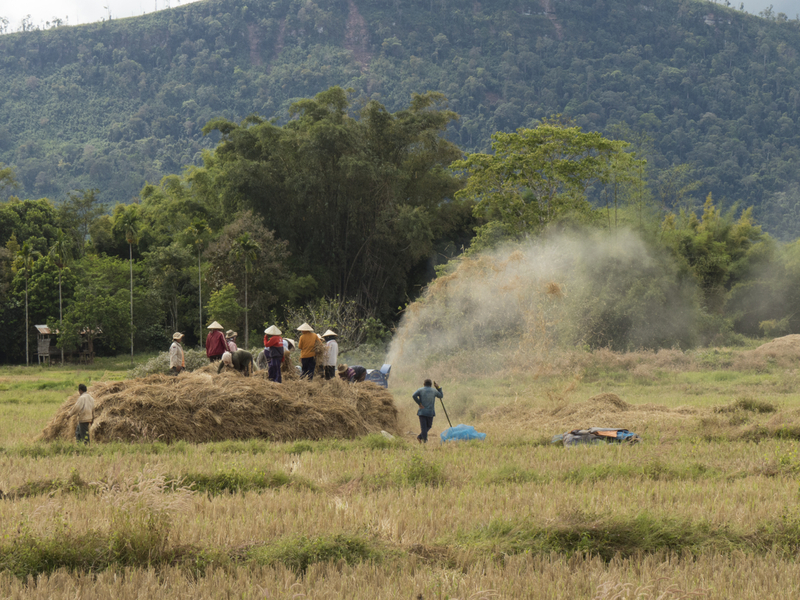 As they cultivated more and more rice the UXO presented a significant danger. 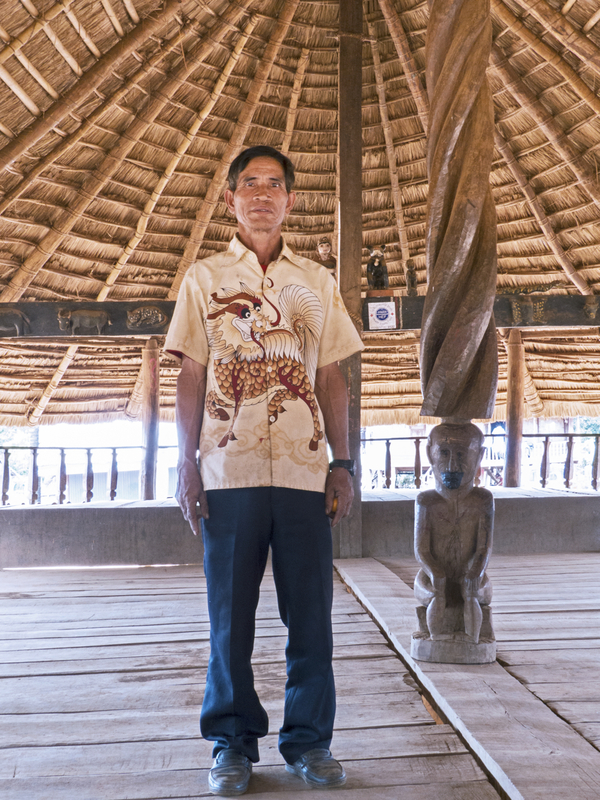 Michel had kept the 2 page article from Laos Airlines that talked about the Katu and mentioned the tribe at Ban Kandon. We gave the pages to Wipad who was obviously proud to see his village mentioned in the magazine. We warned him that more people will probably be coming in the future as they read the article. This was confirmed by Aod who is bringing a group for the festival in March. Aod mentioned to us forms must be filled out and submitted to the government before a home stay is allowed. After we talked for a little while Wipad invited us for a walk around the village before lunch and we all followed him as he led us toward the center of the village. 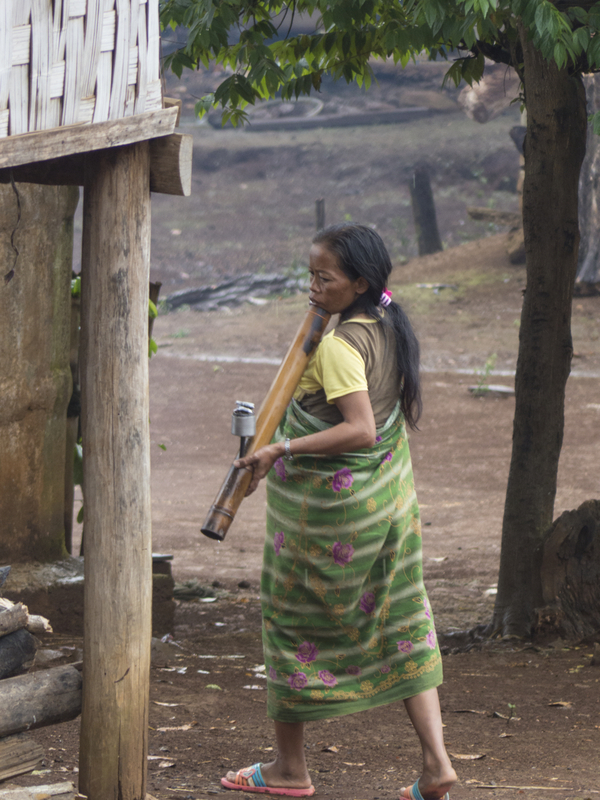 The Katu people believe they must live in harmony with everything around them. If that harmony is disrupted by breaking a taboo or tradition then an action must be taken to appease the spirits. All sickness is a result of disharmony with the spirits. Harmonious relationships between tribe members are very important and any breakdown in those relations will result in disharmony and will cause sickness. There are two important Katu festivals. The first is the rice festival when the members of the tribe share excess rice with the rest of the community on December 29th. The second and most important festival is on March 5th. This is the festival for the sacrifice. The men in the village will wear masks and dress in traditional clothing. The women will dress in their traditional weavings and Katu music will be played. A minimum of three water buffalo will be tied to posts in front of a central building called the community house. The men will dance around the buffalo with spears. Eventually spearing the water buffalo to death. There are 3 shaman (holy men and women) in the village. 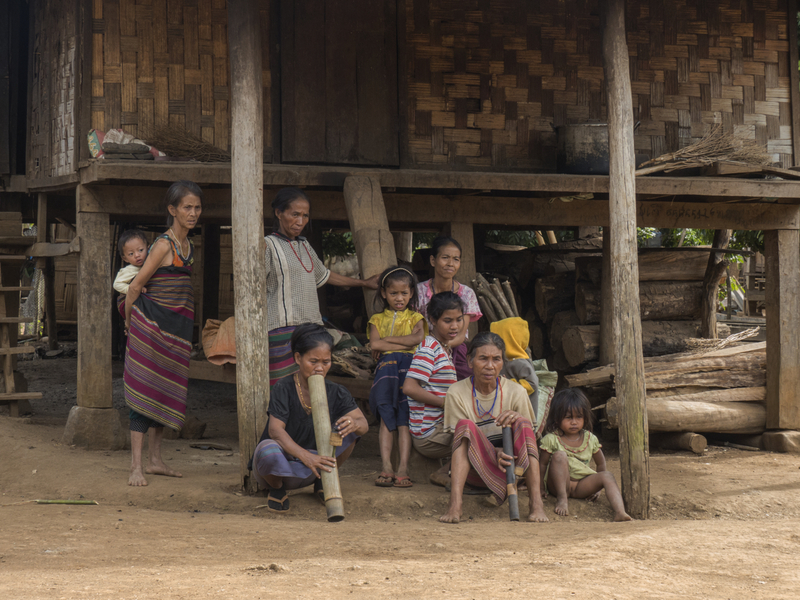 If there is a problem with a family in the village a shaman places a long bamboo stick in front of their hut. That family must promise to sacrifice a buffalo on the annual day of sacrifice. They may have to sacrifice something else right away to avoid sickness. Maybe first something with two legs (ie; chicken) until a bigger 4 legged sacrifice may be made on the traditional day of sacrifice. Wipad led us down a pristine dirt road through the village. Many of the homes are built of bamboo siding and tin roofs. 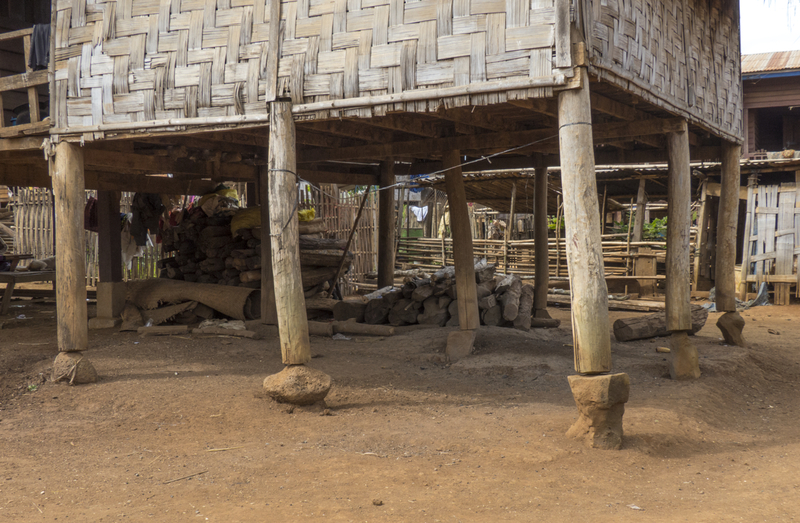 Some of the people have prospered enough to build Laos wooden homes but there are still traditional Katu huts with bamboo siding and thatch roofs. Most of the villagers were not working in the fields and were sitting underneath or around their homes smoking tobacco in Katu water pipes. 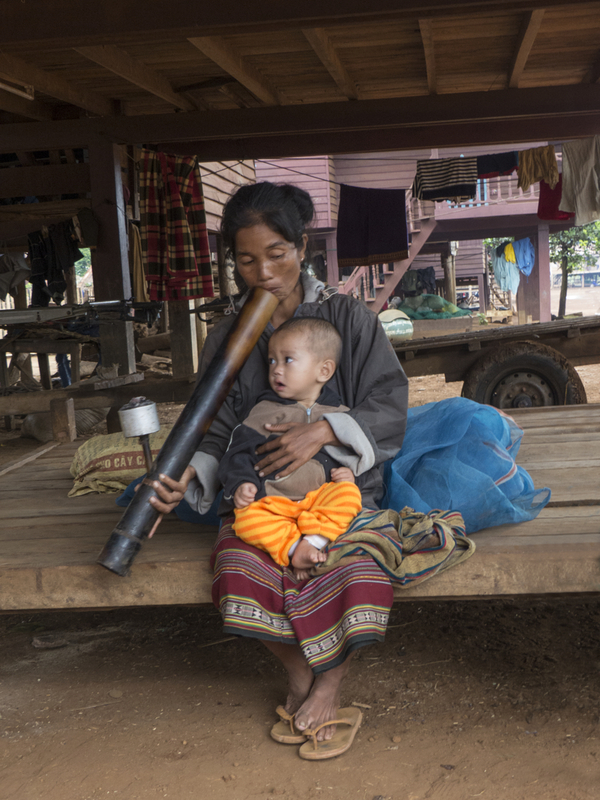 All Katu people smoke tobacco, which they grow themselves, even the very young. They consider smoking from the Katu pipe to be a natural way to improve health and relax. We did not find anyone wearing traditional clothing. 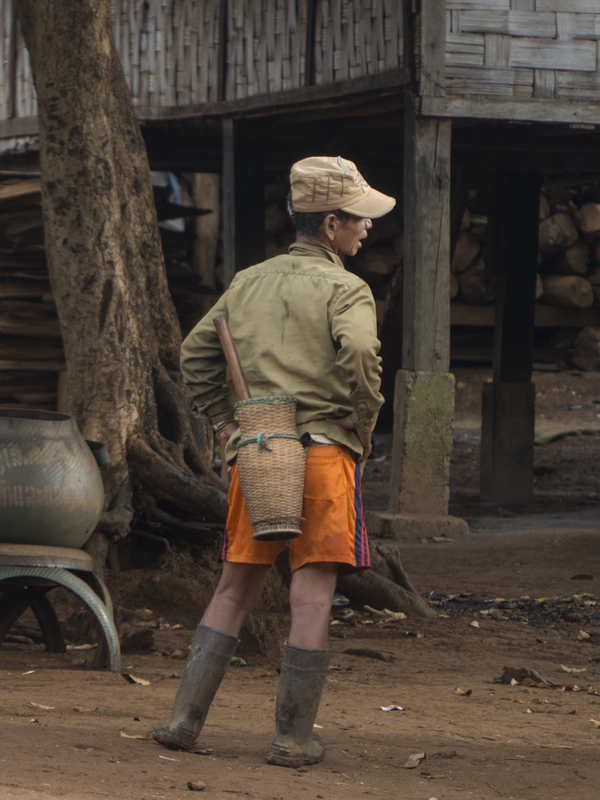 They were all dressed in normal Laos clothing or dressed to work in the fields. Many of the women were weaving. 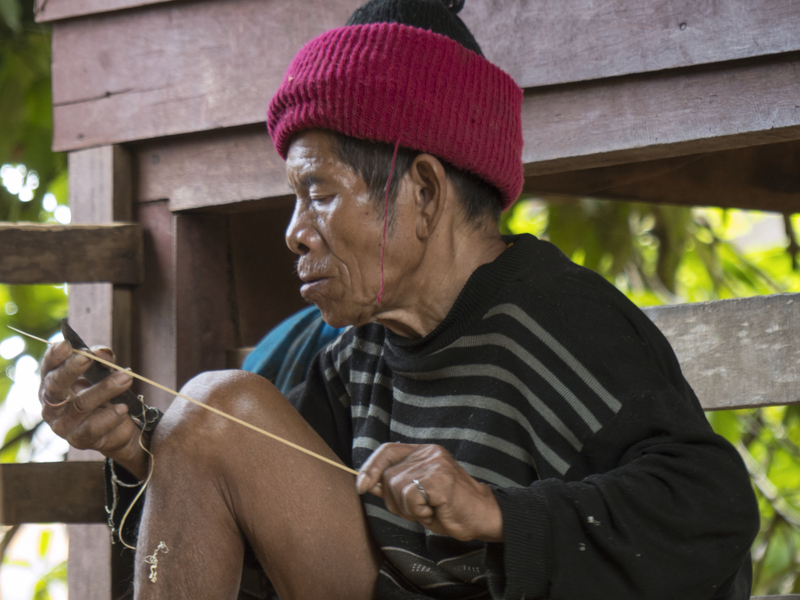 The women weave the story of the Katu people into their fabrics. Women begin weaving at 10 years old. All of the people in the village were happy to meet us. The children were playing with homemade toys. The women and men where sitting under or around their huts chatting and laughing. We were greeted with smiles and Michel was allowed to photograph almost anything. Of course, we had Wipad at our side which certainly gave us more freedom around the town. In my research I had learned that before planting season the Katu made decisions based on their dreams. If the night before the planting a Katu had a bad dream it was considered a communication with the spirits and the planting might not occur or the location of the field for planting would be changed. Wipad explained that since moving to Ban Kandon some of these old customs had been discarded and the tribe had their best rice production this year. There was plenty of excess rice to be shared at the upcoming rice festival. Eventually we made our way to the community house. 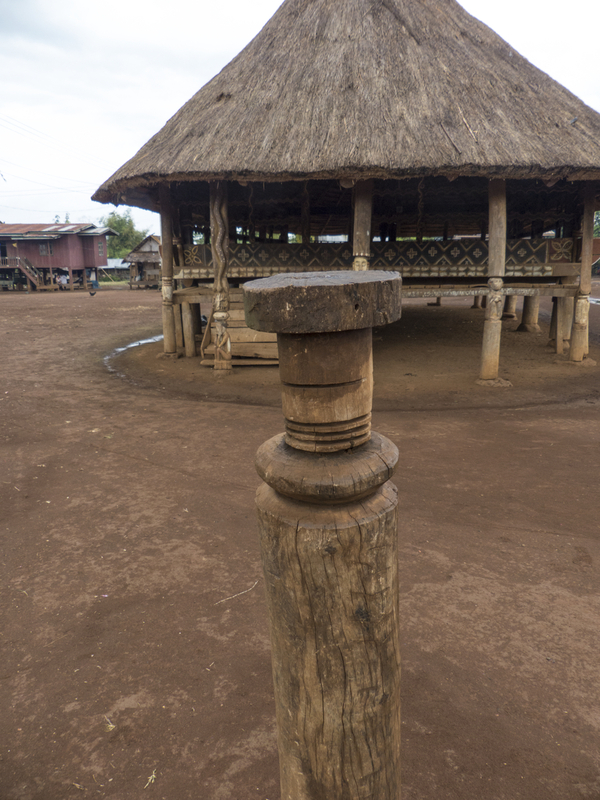 The community house is in the center of the village and all Katu villages are styled in the same way. 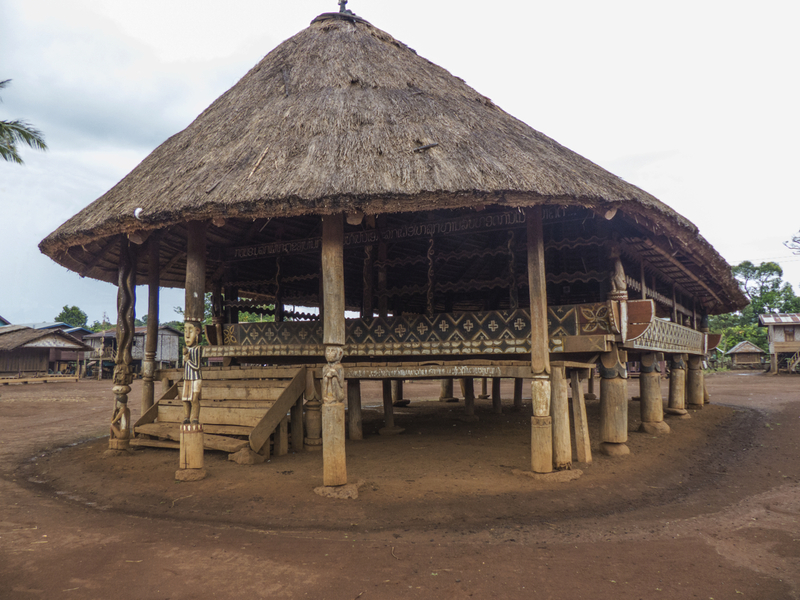 This particular structure had been moved from the previous village to Ban Kandon making it very old except for the thatched roof which was recently redone. All markings on the community house have meaning. There are 3 carved pillars in the front entrance. The pillar on the far right has a carving of a monkey holding a coconut. Wipad explained : The monkey holding the coconut teaches us not to hold on to things. The monkey cannot drink the coconut milk or eat the coconut but he does not let go. Don’t live like a monkey. 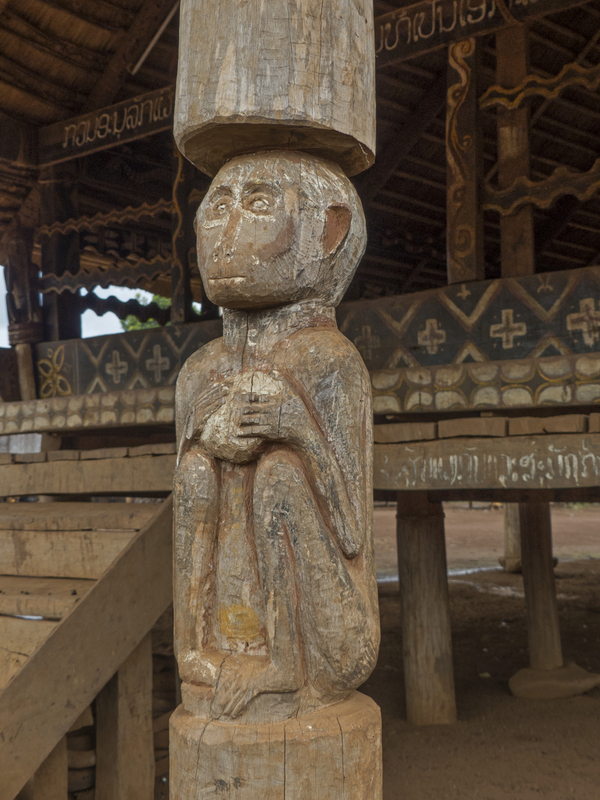 The central pillar holds a detailed carving of the ancient Katu. Note: the long Khmer style ears that were stretched over an object. The far left pillar is a carving of a man underneath frogs being eaten by a snake. Wipad explained:The snake eating the frog demonstrates one eating the sole of another. It is better not to take too much for yourself or from other people. If you have too much share with those in need. As we entered Wipad pointed out the story of the Katu people written over the entryway. There are several birds carved on the beam above the writing. 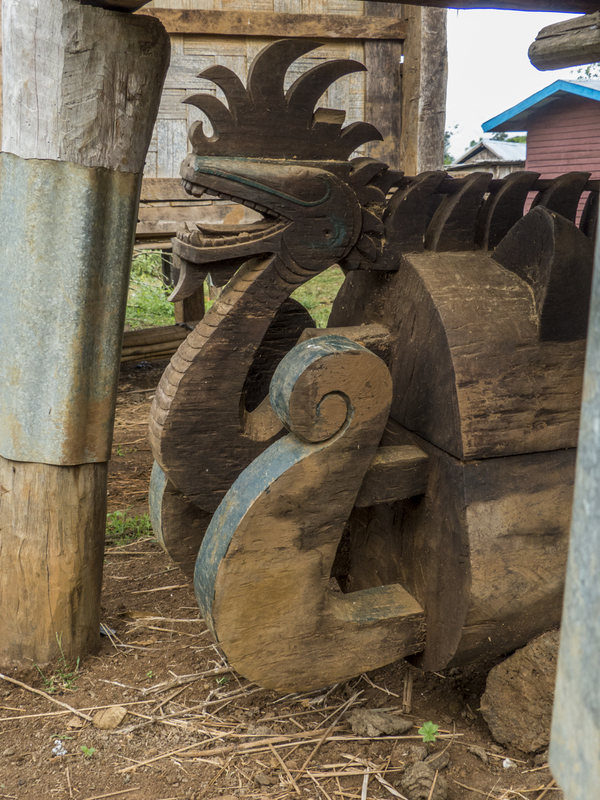 These symbolize actual birds of the forest and if one of the live larger birds lands on a Katu hut it may bring sickness. 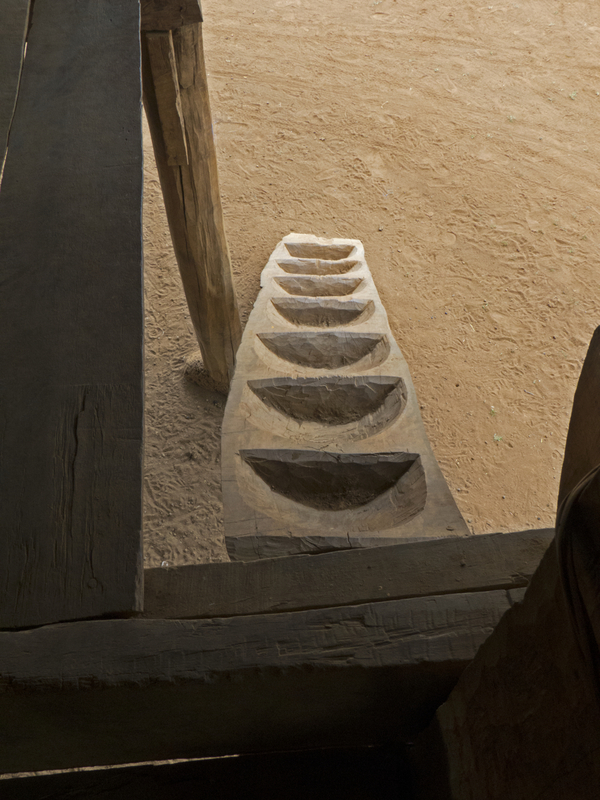 Other animals are carved in a beam around the building that teach the tribe what animals to eat and sacrifice. 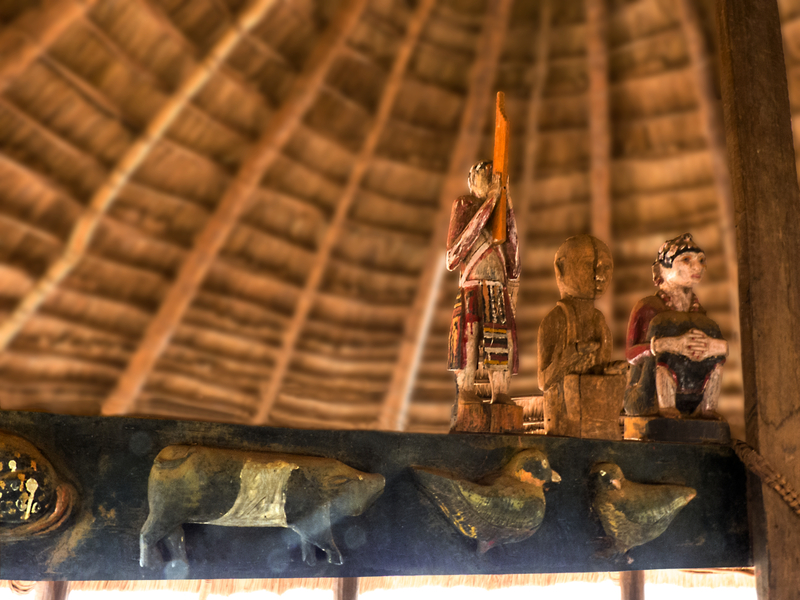 We moved in to the center of the community house and Wipad explained:The chief is carved into the base of the center pillar. 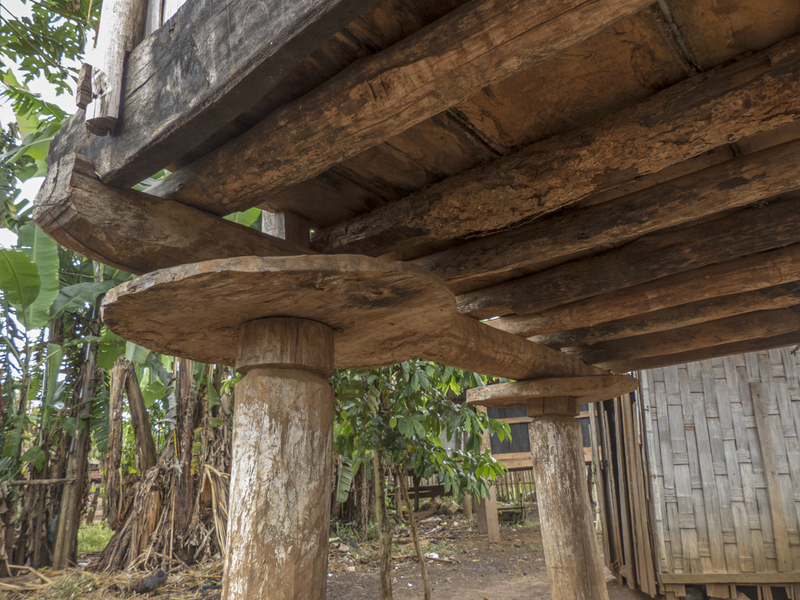 It is upon the chief that the weight of the community rests just as this pillar holds up the community house. A winding pattern is carved into the same pillar that wraps up to the ceiling. This represents the ideas of the tribe. 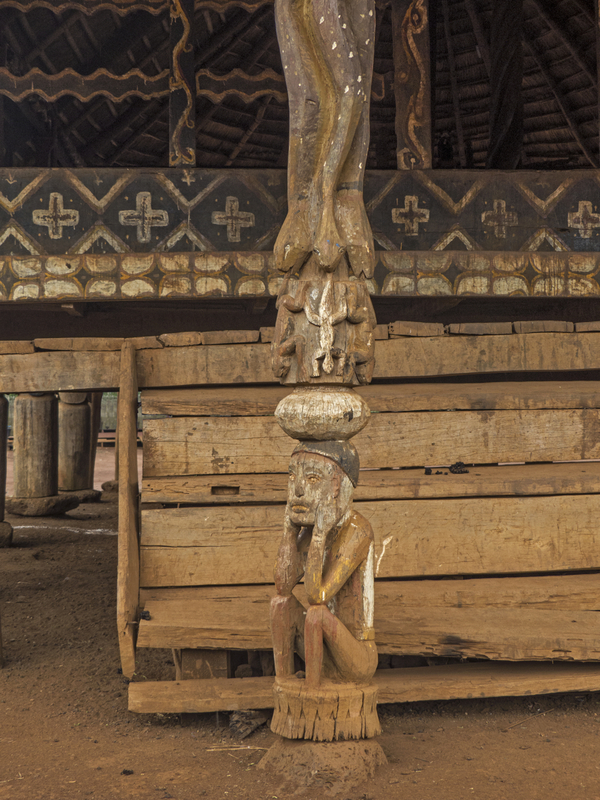 At the back of the community house were many carvings and figures sitting on the beams. Wipad explained that specific figures represent the story of the creation of the Katu. The Katu believe in the beginning there was a woman made pregnant by a half animal half man being. The woman gave birth to two men and one woman. In between each of these births she gave birth to animals. Then one of the man children died. The remaining woman and man gave birth to the first Katu. 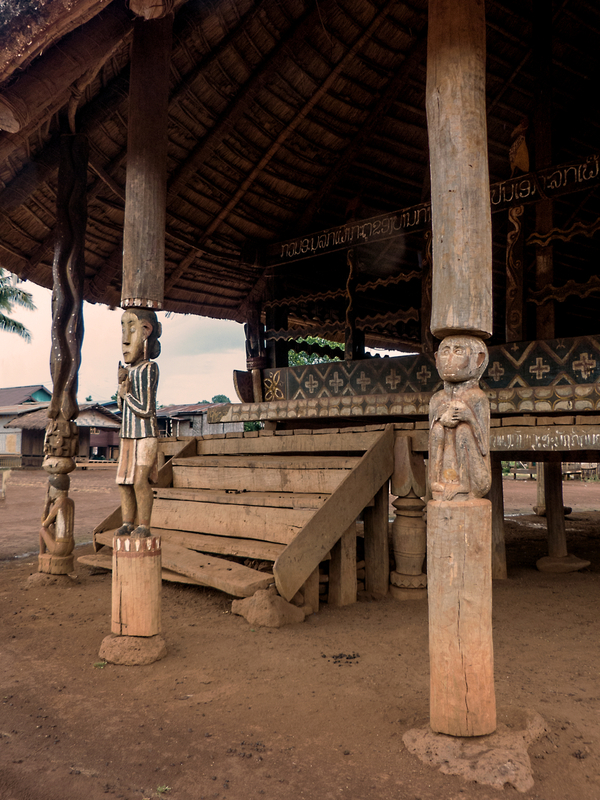 During our conversations with Wipad I was moved by the rules for the Katu tribe that are carved into the community house. Their beliefs suggest ideas for the community that ring true in any society. The placement of the bamboo stick in front of the home of someone who creates disharmony with his neighbor is visible to all of the tribe and is certainly a better way to encourage good behavior then some of the tools we have in modern society. As I watched Wipad explain these ideas I sensed that he considers himself responsible for keeping the tribe safe from other ideas and influences from the outside. His close supervision of us and our interactions with the tribe implied this as well. Wipad is the base of the central pillar for his village. We were invited back inside his home for a very tasty lunch. His wives had prepared multiple dishes with the vegetables and beef we had brought. Some of them were sweet and some spicy and they were served along side the traditional Laap and sticky rice. During lunch Wipad provided more information. He has been chief for 15 years. Last year during the festival of sacrifice 22 water buffalo were sacrificed. Neighboring tribes attended and the meat was shared among all of them. There are about 1500 people in the village now, 589 of them are women. There are currently 301 children attending the local school with 7 teachers. Children start school at age 5. During lunch we also talked about ourselves a bit. Wipad asked how many children Michel and I had and was disappointed when we said none but satisfied that Delphine did have children. We also told our ages and as usual everyone attending was surprised by Michel’s age. Later in the day I received positive comments from the locals about how fit Michel was. The Katu live until an average of 62 years old and by their standards Michel is very unusual. 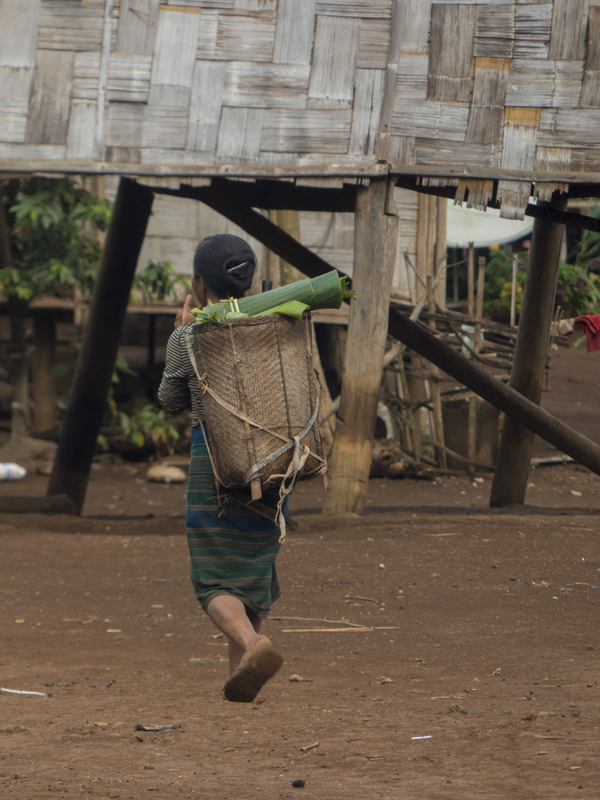 In the afternoon, we were escorted out to the area where the rice is stored in small huts and allowed to see another important Katu tradition. 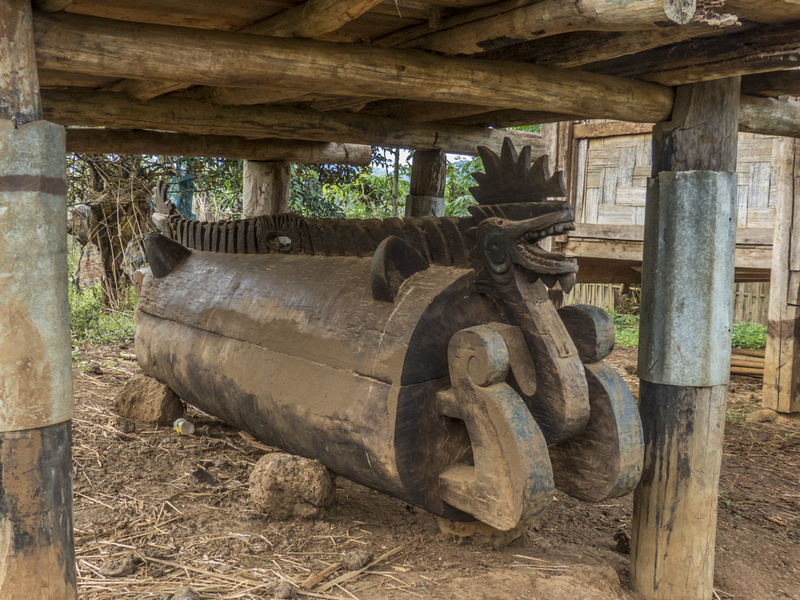 The Katu carve caskets for themselves before they die. The caskets used to be stored underneath each families hut but are now stored in back of the village underneath the rice huts. The casket pictured here was carved for one of the Shaman and is very ornate. The second casket is more typical. The caskets are carved from large trees in the forest. 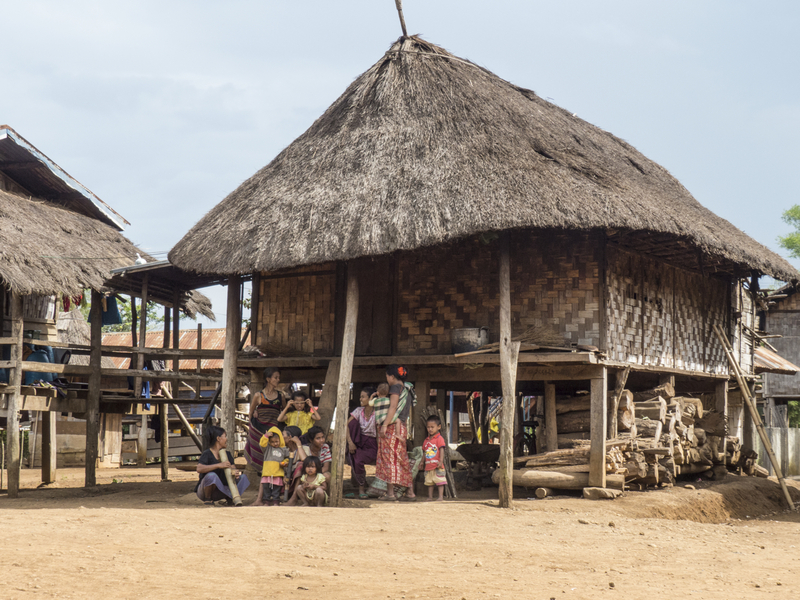 Now that the village has moved down from the forest this custom is also difficult to sustain. As the sun was setting we sat with Wipad one more time and gave him our gifts and offered our thanks for the day. He thanked us for everything and shared some of the cookies with his young ones right away. He thanked us for the soccer ball but noted that he did not play soccer and would give it to the school, smiling all the while. We climbed back into the van well satisfied with the first day of our adventure. We knew that by having Aod with us as an interpreter we had been able to understand more about what is common between our own communities and the beliefs of the Katu people. We also realized how important Wipad is to his people and we fear for the village when someday they will lose him as their leader. Here you will find more information about ideas like the blood sacrificed and similarities between European vampires and some Katu spirits. The document also covers Katu participation in the Vietnam war and their government motivated exodus from their forest homes. Wonderful……now, i want to go to visit there !!! You will enjoy it. Hope your holiday in the north was wonderful too! It’s good to relive the story in photos and excellent explanations written by Claire Unforgettable moments, and some really beautiful pictures Thank you again! Wow, that is so interesting Claire and such wonderful pictures. What a snapshot in time. I was saddened to hear that some people are watching TV and the gang influences are creeping in to the culture, for no doubt if they have access to the Hollywood and entertainment industry junk it can only hurt their simple culture and lifestyle. I would imagine the government would try to restrict the influences allowed on TV and radio?…. do you know? But I would imagine it is only a matter of time before people begin to see their world in contrast to TV images and be influenced. So wonderful that you were able to see the culture before it changes. So sorry about the animal sacrifices but then we sacrifice many animals in our culture and wrap them in plastic and put them on display at the grocery store so I guess we cannot point fingers. I must confess though that I would not want to have the scarlet letter of disharmony, or branch as the case may be, placed in front of my house, for with Joshua’s difficult behavior and special needs we would most likely be shunned in such a community. I thank God for grace and forgiveness instead of legalism and sacrifice. Jesus came to be the final sacrifice as the lamb of God and I am so grateful that he has atoned already for all our mistakes/offenses and eliminated the need for a tradition of animal sacrifice. Curious in your travels have you gained any understanding of how they respond to special needs children? Are they allowed to survive? Are they shunned as a bad omen or bad spirits or bad families, or are they embraced and supported by their communities? Do they have the Autism/ADD epidemic we have in the developed countries? So many questions, but that is just a few to start with. So happy you are enjoying your travels and adventure. Love the pictures. You seriously have material for a photo and information book you could publish and sell. Most excellent and exciting! Thanks for sharing! Thanks so much for your great response. I have met very few special needs children here but I did identify at least two in villages that we have passed through. Each time I regretted the language barrier that kept me from knowing more. One child looked like perhaps he had autism. His mother was living in the village and taking care of him the same as all of the other mothers. 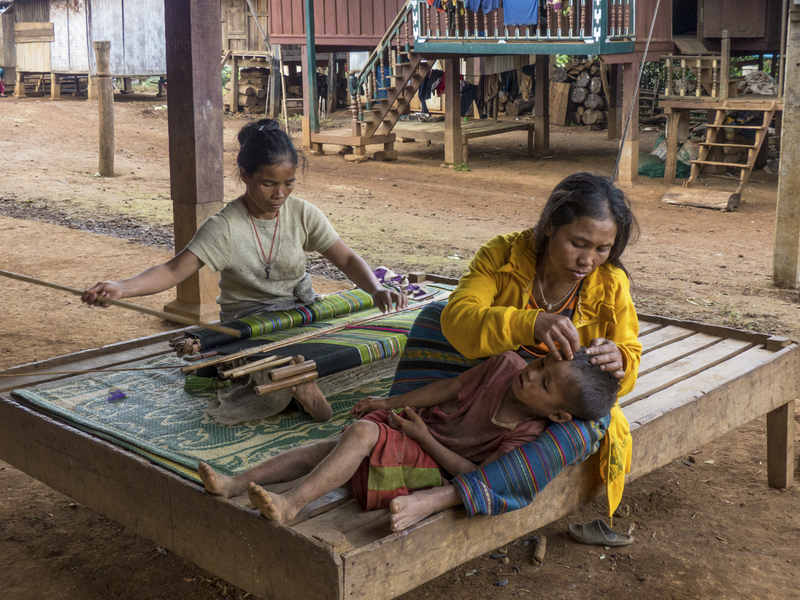 Medical care in Laos is not good at all and even if the government is sponsoring all of it for this child not much help will be given. It is very possible that the parents may be blamed for their children’s problems in the more spirit based cultures. However, almost all villages are influenced by Buddhism here and that is good news. Buddhism will encourage others in the tribe to help those who are less fortunate. It’s a tough life here though. Eating and survival are often the top priorities. Very very different from everything we know back home. I believe it is even more difficult for parents of special needs children in this culture. You and Joshua are blessed to be together and in the culture that you were both born into. With all of it’s short comings there are so many that are much worse. Oops, meant to say our movies come here unsensored. 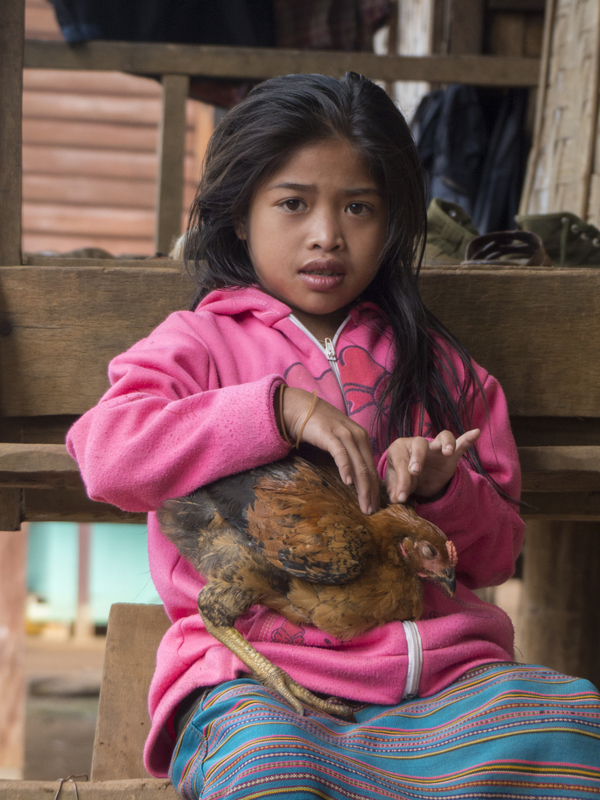 Claire&Michel, what an awesome chronicle of your magical experience with the Katu Tribe in Laos. A fabulously informative documentary with beautiful photographic images that captivate the viewer’s full attention. Leaves me with wanting more….safe travels…happy new year 2014…. Thanks so much! Wishing you both a wonderful New year. We are so happy to hear from you. We think of our day in Ban Kandon with the Katu as one of the most important days during our time in Asia. We are very excited to have you read about it. We have returned to the U.S. for a little while but when we go back to S.E. Asia we would love to visit your village. You can email me directly at clairemurphy0101@gmail.com.